Getting about by bike is great for you!! Middle-aged people who cycle regularly typically enjoy the fitness level of someone 10 years younger, and gain two years in life expectancy. And it’s great for society, reducing pressures on the NHS, on our worsening climate and on our fragile environment. But what of the dangers that worry people – crashes and pollution – whether you are on a bike or too scared to use one? 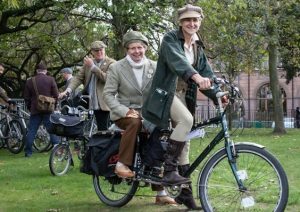 Yes, these are very serious and must be tackled through infrastructure, restrictions on motor traffic, and other means – but even now the health benefits of getting about by bike hugely outweigh the negatives. 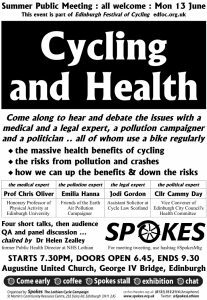 To investigate these issues our summer public meeting is on Cycling and Health, with expert speakers on physical activity, air pollution and road danger. As you would expect, all our speakers use a bike regularly. If you’re on twitter please RT our @SpokesLothian tweet about the meeting. If doing your own tweets use hashtag #SpokesMtg. Our Summer Bulletin [end of May] will contain a Cycling and Health supplement, with articles by our meeting speakers and references to background documents.